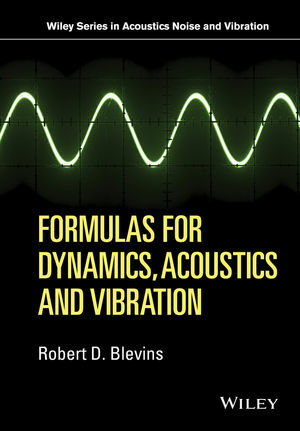 With Over 60 tables, most with graphic illustration, and over 1000 formulas, Formulas for Dynamics, Acoustics, and Vibration will provide an invaluable time-saving source of concise solutions for mechanical, civil, nuclear, petrochemical and aerospace engineers and designers. Marine engineers and service engineers will also find it useful for diagnosing their machines that can slosh, rattle, whistle, vibrate, and crack under dynamic loads. Robert D. Blevins is a Fellow at United Technologies. He directs experimental and analytical investigation of dynamics, acoustic, vibration certification issues for commercial aircraft engine systems. Previously he participated in design of nuclear power plants. He has performed flow-induced vibration analysis and test of aircraft, off shore platforms, and vibration of heat exchangers at refineries, nuclear power plants and chemical process plants. He has taught the Flow-induced Vibration Seminar for the ASME for the past 20 years. He received his Ph.D and MS from the California Institute of Technology and serves the ASME special working from on dynamic analysis on the ASME Boiler and Pressure Vessel Code. He has over 50 published papers.